They say that necessity is the mother of invention, I think it's also thrift. I'll admit it, I'm cheap, which is one of the reasons I've had to come up with so many non-traditional container gardening ideas. It helps that I love going to yard sales and thrift stores and finding baskets, tea cups, baby shoes and other odd things to turn into containers. Though classic pots can be stunning, I also love up-cycling and coming up with new ways to plant. 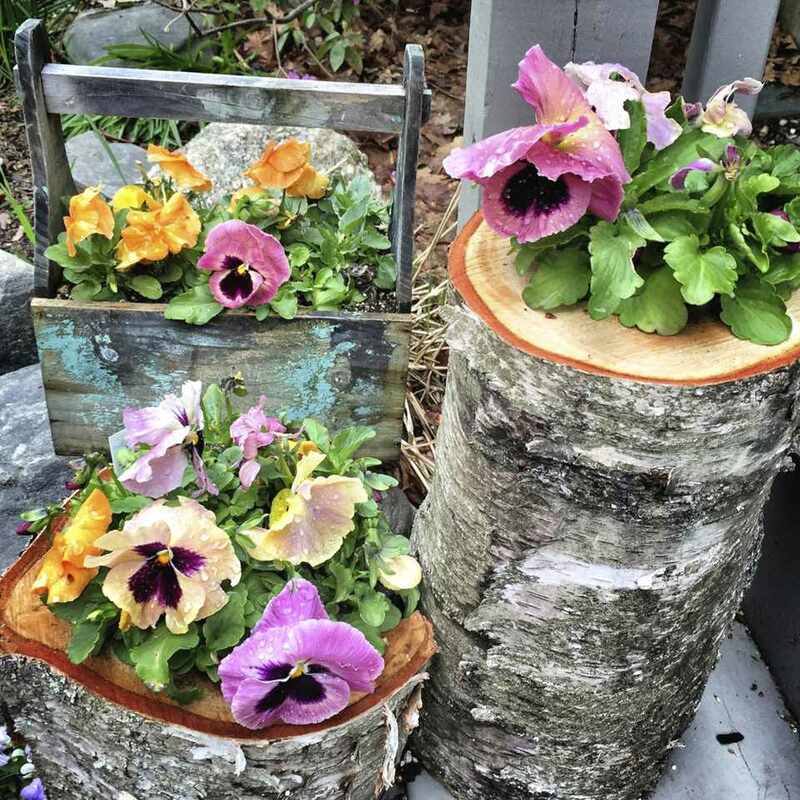 When figuring out what to plant it, remember, that while almost anything can be transformed into a container for a garden, there are a few things to keep in mind. Make sure your pot has or you can make sufficient drainage. The bigger your pot and the more soil it can hold, the more latitude you have with plant care. Here are some of my favorite container garden ideas. You can find old baskets at thrift stores, yard sales and Dollar Stores for less than a dollar. I buy them even if they are falling apart a little bit. I can usually glue them back together, turn the problem to the back, or just ignore the imperfection and call it "distressed." To jazz up a basket, I will often spray paint it in a bright color. After years of trial and error, I now line baskets with clear, lightweight plastic, either the kind you get at the dry cleaner, or a lightweight flexible bag. I cut lots holes in the bottom for drainage. You can also line baskets with moss. Unless the basket has large holes so the moss would be seen, I generally use plastic, because it is less expensive and helps the soil to retain moisture. I often use moss as a top dressing for a finished look. After lining the basket, I fill the it with potting soil, usually about an inch below the rim. I then tuck the edge of the plastic under the soil. For Instant Garden Gratification, CHEAT! Part of the reason I love container gardening is the possibility for instant gratification. One of the most satisfying ways to achieve a full and beautiful planter, is to cheat. Buy a lush and fully filled out hanging basket then cut or pull off the plastic hangers and then pop the whole thing - right in it's nursery pot - into a container. If it sits too low in the container, you can put a bucket, pot or plastic container, upside down in the bottom and put your flowering basket right on top. Sometimes it takes a few tries to get the right level, but you generally want it to sit about an inch below the rim of your pot. Putting Spanish moss around the pot is a good way to hide it and make the container more interesting. The only thing about tea cups is that you have to drill a hole in the bottom and sometimes it's a challenge to make a big enough hole without breaking the cup. It helps to have a special ceramic bit and it is key to make sure that the tea cup doesn't get too hot from the friction of drilling. When I first started container gardening, I have to admit that I swore I would never use shoes as container gardens. Now I love them. I've used super swanky high heels, rubber boots and baby shoes. Most shoes have drainage built in but if you are using rubber boots, you will have to drill or cut holes in the bottoms for drainage. If your shoes are waterproof you don't have to worry about it, but I lined these stilettos with a plastic bag, so they would last longer. Fill your shoes with good quality potting soil and make sure to mix in some all purpose fertilizer if you potting soil doesn't already have it. You can form a basket out of Spanish moss if your shoes are open and put potting soil in the moss. Most shoes won't hold a lot of soil, so use plants that have shallow root systems. Moss, some herbs, and succulents all are good choices. Also, because they won't hold much soil, they dry out really fast, so make sure to water them regularly. If it's hot and windy, depending on the types of plants, you may have to water twice a day. One way to get container garden ideas is to peruse hardware, housewares and Dollar stores. I love using aluminum buckets, troughs and plastic pails from the hardware store. From housewares stores, I get laundry baskets, plastic garbage cans, and colanders. From Dollar Stores and Target, I get glass jars for terrariums and bright plastic cups and bowls. I love growing things in bags of all kinds. Purses, re-usable grocery bags, back packs, you name it, but this is one of my favorites. I bought this gold lame evening bag in a second hand store for $2.00. I lined it with plastic, cut a drainage hole in the back and it lasted a few seasons.